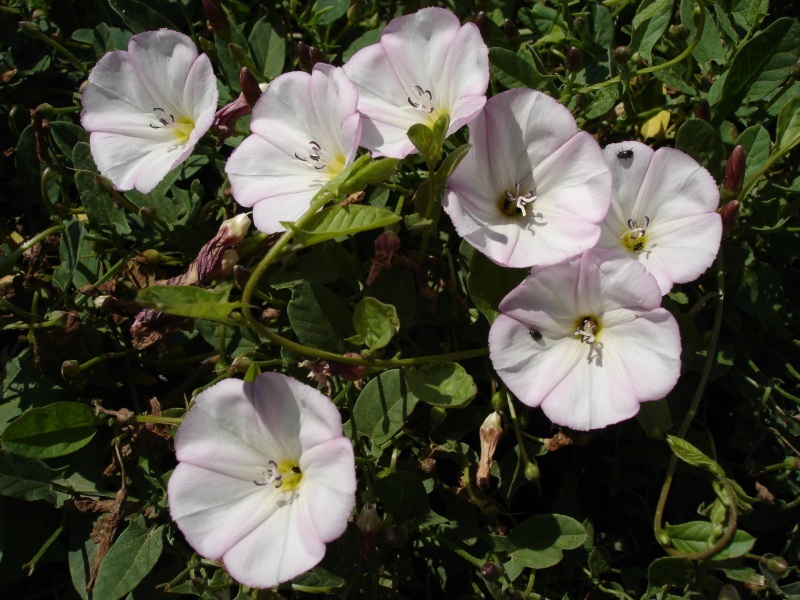 Convolvulus arvensis is a perennial, herbaceous vine, stems to 1.5 m long, branching freely, from buds on deep, spreading roots and rhizomes, root system may covers an area of 6 m wide 9 m deep in suitable soil, climbing or tangled in low vegetation. Leaves alternate, narrow, arrow-shaped, 1-5 cm long, basal lobes triangular but variable. Convolvulus arvensis flowers. en.wikipedia.org (Accessed 1/2018). Flowers white to pink, funnel-shaped, 1.5-2.5 cm long, 2.5 cm across top, sepals 5, green, ovary superior; floral bracts 2, linear, to 1 cm long, midway up flower stalk, flower stalks longer than leaves; blooms May-Sept. flowers last one day; insect pollinated by halictid bees (including Agapostemon texanus, Augochlorella striata, and Lasioglossum sp. ), honeybees, bumble bees, butterflies and moths but are also self fertile (Mulligan and Kevan 1973; Handel 1983; Weaver and Riley 1982). Fruit dry, hollow, capsule, almost round, splitting open to release 1-4 seeds, to 0.5 cm, 3-sided. Frequency in NYC: Infrequent, but may be under-counted. Habitat: An agricultural weed of open fields, roadsides. Notes: Prefers rich, calcareous soils, intolerant of flooding and wet soil. Seeds eaten by some birds and rodents, may be dispersed by birds due to impermeable seed coat. Seeds in soil are viable for over 20 years. Seedlings emerge in May, rarely bloom during first season. . Plants and roots are eaten by some animals (Martin et al. 1951). Field bindweed leaves are eaten by larvae and adults of the Argus tortoise beetle, Chelymorpha cassidea. 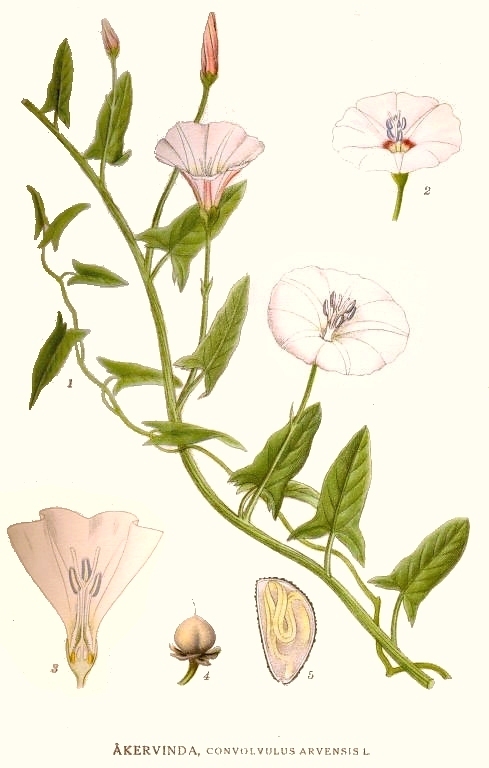 Numerous other insects have been found on field bindweed. It is also host to a number of fungi including Puccinia convolvuli, Septoria convolvuli and Stagonospora convolvuli (Weaver and Riley 1982). First reported in N. America in 1739. Used as a medicinal and ornamental but also introduced from ship ballast. (Austin 2000).